Our services are reverent in worship style and based upon the Christ-centred teaching of the Bible. Each service includes prayer, praise and preaching. We believe that the Bible is fully relevant to our lives and the day and age in which we live. Our teaching from it aims to show how the wisdom of God should mould our everyday life, influencing our thinking and actions. 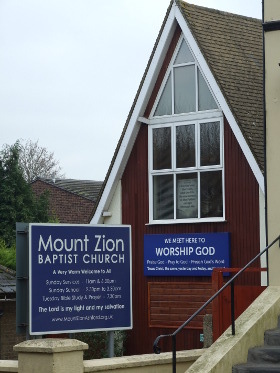 People of all ages and social backgrounds attend Mount Zion Baptist Church. We offer help and support to each other as God works to transform us to a Christ-centred lifestyle. You would be very welcome to visit us either for the first time or returning after some time. Maybe you attended the Sunday school in the past and would like to pay us a visit. We would be very pleased to see you. Prayer Meeting - 9.45 a.m.
Evening worship - 6.00 p.m.
We welcome all children and young people aged 4 to 16 years to come and join us every Sunday afternoon 2.30-3.30 p.m.
Tuesday meeting for Bible study and prayer - 7.30 p.m.
Take a slide-show tour of the Mount Zion church building.